I’ve always been a fan of using manipulatives for math, especially for kids who are just learning a new concept. You can add with them, subtract, multiply, or even divide. Manipulatives are a great tool to use with any kid to help illustrate math concepts. 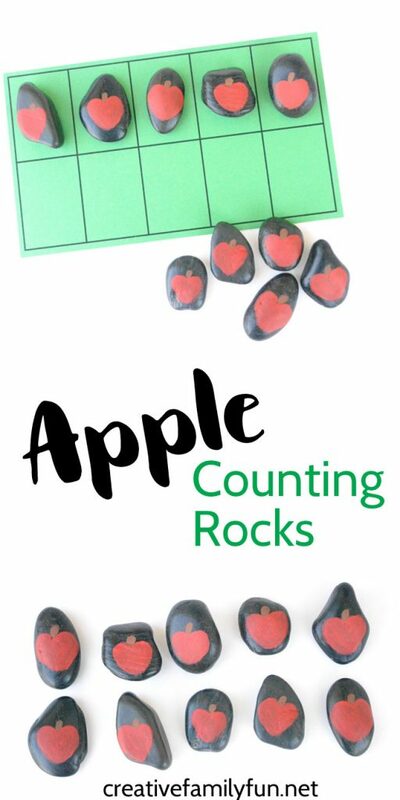 This simple set of Apple Counting Stones is perfect for either preschool or early elementary math. They’re easy to make and you only need a few supplies. Pick out ten black stones. I tried to find ones that were smooth enough on one side for painting and also sat nicely on a flat surface. (I didn’t want a stone that would tilt or wobble.) Also, make sure the surface is wide enough to paint an apple. Use the red paint to make your simple apple shape. An apple is super-simple to paint. Make a modified heart shape. Make the top of the heart a bit shorter and instead of a point at the bottom, make it wider and flatter. Keep it simple! It doesn’t need to be perfect. Finish your apple off with a short brown stem. Note: In order to get the dark, vibrant colors, I had to paint over my apples several times. The first coat went on super thin and then I got a deeper coverage on each coat. Each coat of paint only took a couple of minutes to dry, so don’t worry, this project didn’t take all day. I painted 4 coats, but however many you need depends on the brand of paint you use and how dark you want your apples. 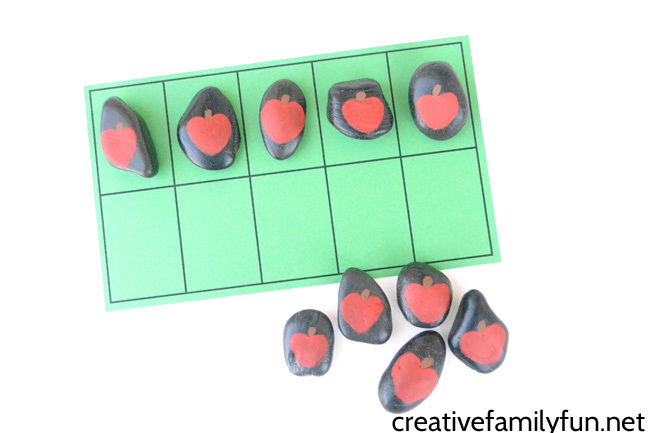 Play a Simple Counting Game: Use these rocks with a child who is just learning to count. 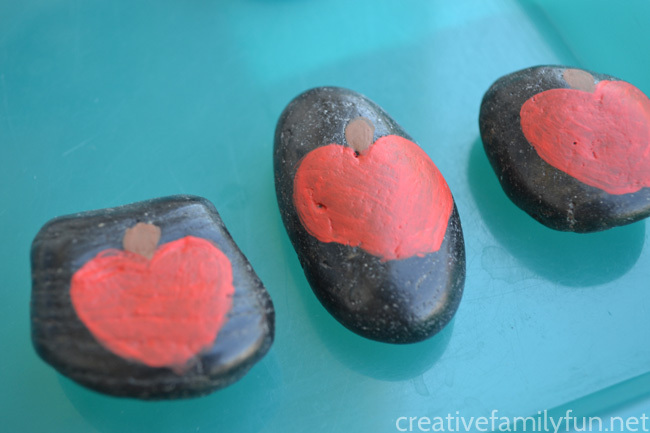 Give your child small groups of the rocks and have them count them one at a time. This is a simple way to practice counting with a child who is still working on 1-10. Play Apple Hide and Seek: Hide the apple rocks around the room. Have your child search for them, counting along the way. Once they reach 10, they’ll know they’ve found them all. 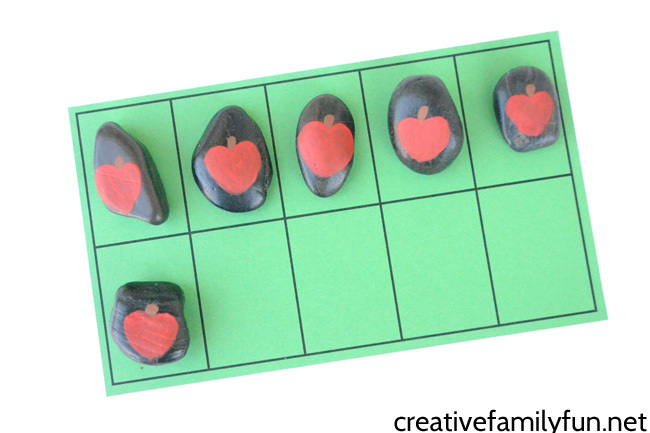 Use the Stones as Manipulatives on a Ten Frame: A ten frame is a great way to visualize numbers from one through ten. Have your child place 4 stones on a ten frame. Then have them count and add the correct number of stones to fill in the ten frame. Another version is to have the stones already on a ten frame. Place anywhere from one to ten stones. Have your child count and tell you how many stones are there. Practice being able to say the amount without having to count each stone one by one. You can get a ten frame to use with these stones at this link. It prints landscape and takes up almost a whole sheet of paper. It’s the perfect size to use with your Apple Counting Stones or any other larger manipulative (such as Duplo Blocks or toy cars). What Makes 10? What number combinations will create 10? Use the ten frame and your stones to find out. If you have 4 stones, how many more do you need to create 10? For an added challenge, try it without the ten frame. Practice Adding: Set out two groups of stones. Have your child add the two groups together. How many stones are there total? Practice Subtracting: Set out a group of stones. Ask your child to take away a certain amount. How many are left. For example, give your child 5 stones and ask them to take away 3. How many stones do they have left? 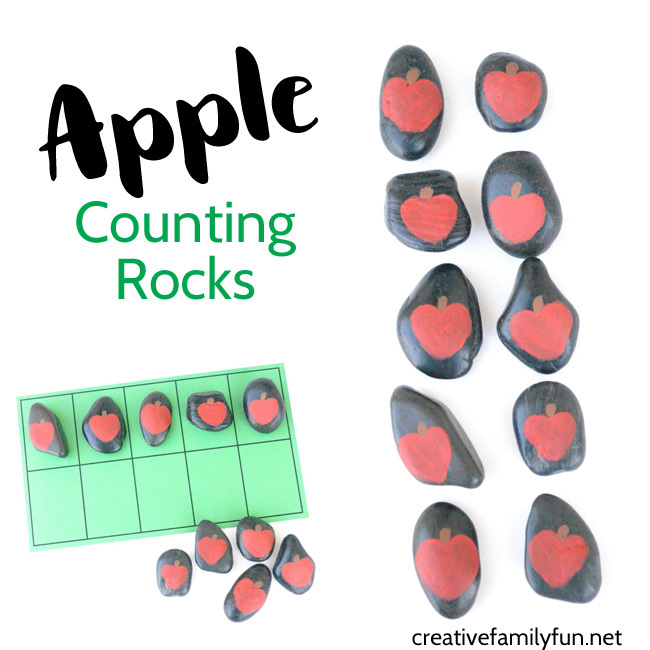 These Apple Counting Stones are a great math tool and can be used in so many ways. How will you use them?